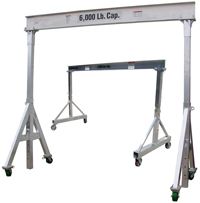 Portable Gantry Cranes | Aluminum Gantries | EC & MW, Inc.
All of EC&MW’s portable gantry cranes are able to be rolled while loaded with the exception of one, the All-Terrain Series. We design and manufacture a complete line of unique, first of its kind, portable aluminum gantry cranes, stainless steel gantries and our patented machinery moving skates and more. If we do not have exactly what you require, we can design a custom aluminum portable gantry crane to meet your specific lifting needs. All of our gantries are made in the USA! Compliment your new portable gantry crane with hoists, trolleys, slings, forgings, custom moving crates, and patented machinery moving skates. Think Outside The Box We always have. We were the first ones to build and put in production a portable aluminum All-Terrain gantry, Removable Leg gantry and Air Tire gantries as well as our Cart Assemblies. With over 50 years of machinery moving and rigging experience. We used them, before we ever built them! Don’t settle for a copy, choose the original. Roll While Loaded Were you wondering? Yes, all of our aluminum gantry cranes are designed to be rolled while loaded, with one exception. Our “standard” All-Terrain gantries do not roll while loaded. But wait! Yes, we make a custom, build to order, All-Terrain gantry that does roll while loaded. Several wood and stone artists have purchased our rolling All-Terrain gantry cranes. A-Frame aluminum gantry cranes are the most popular style used in industry. We have a complete line with heights to 14′ under the beam. Professionally Engineered You can rest assured that all of our gantries are P.E. engineered and have been either broke tested to identify high stress areas or load tested to meet our in house requirements. We manufacture all our aluminum gantry cranes to exceed ANSI B17.30, of 125% load test requirements. Click Link: Standards. Certified Aluminum Welders Whether it is one of our standard model aluminum gantries or a custom manufactured model, all of our aluminum gantry cranes are welded by certified aluminum welders. Our manufacturing facility uses both semi-automated and full CNC machines in your gantry’s fabrication, so you can be assured of accuracy and repeatability. Heavier Built Why are our aluminum gantries are typically heavier than our competition? Well, KingPinLess casters tend to be a bit heavier, even with aluminum core wheels (when possible). We also believe certain sections of our aluminum gantries have a little heavier structural aluminum incorporated in them. We believe this makes for a better built gantry. Load Testing Would you like your new portable gantry crane load test certified? That is not a problem. We have a certified load scale and weights to load test from 500 to 8,000 lb. capacity cranes. During load testing, we apply the proper testing weight, then roll it back and forth across the total length of the beam. We then roll the gantry front, back, left and right, while applying the load. There is a charge with the load test certificate. 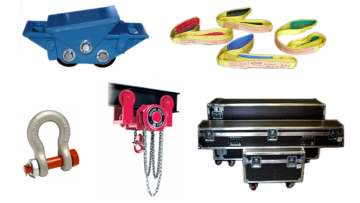 Custom models include a load certificate as part of the cost of the gantry crane. We are happy to supply a letter of engineering and letter of conformance at no charge. Domestic Materials Our custom extrusions dies and standard aluminum shapes are extruded by domestic companies such as: Sapa, Kaiser, Serria and Keymark companies to name a few. Wilson, MFG. Custom manufactures our hitch and lynch pins to our specifications for use on all of our aluminum gantry cranes. They are made right here in the United States in Minnesota. We go the extra length to attach the hitch and lynch pins to the bases and top caps. We use a lanyard system that insures that the hitch and lynch pin always stays with the gantry. No more getting to a job and realizing you lost or have forgotten the pins. KingPinLess Casters While some manufactures use four 1,000 lb. capacity KingPin style rated casters for a 2 ton (4000 lb.) 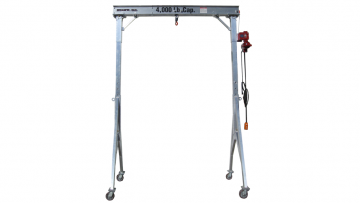 rated gantry crane, we provide four 2,000 lb. capacity rated KingPinless casters with roller bearings. Why the heavier capacities? Well, we know there are going to be times when centering the load on the I-beam is just NOT an option. You can rest assured that our gantry will hold the load! What are KingPinLess casters and what is the difference you ask? Click Link: KingPin vs KingPinless KingPinLess are more durable and have better swiveling capabilities than KingPin. When you are steering your 1,000 to 8,000 pound load, these casters can make a difference. They also require less maintenance because floor grime and dirt cannot enter the bearing raceway as easily. These features do come at a cost, something to remember when comparing ours with others brands. We proudly use RWM, Hamilton, Magus Mobility and Colson Group casters on our cranes, all U.S. based companies. Custom Manufacturing Don’t see exactly what you’re looking for? Would you like us to bring ideas to life? Working alongside us during the design stage, we will do whatever we can to provide you with a perfect design solution for your particular applications. Your new gantry crane can be built from either 6061 T6 or 6063 Aluminum although 6061 T6 is the preferred material. Food, pharmaceutical and waste water treatment facilities/industries are no problem. We can manufacture your new crane from 304 or 316 stainless steel. Inquire about hard anodizing as well. Upon request, prior to production, we can provide Aluminum Certificates, Letter of Conformance, Letter of Conformance from all vendors, Welders Certificate, Certificate of Test for our load scale and Letter of Engineering. We have built aluminum portable gantry cranes for both nuclear and hydro electric power plants. Check out just a few of the custom gantries that we have built. Custom Gantry Cranes.